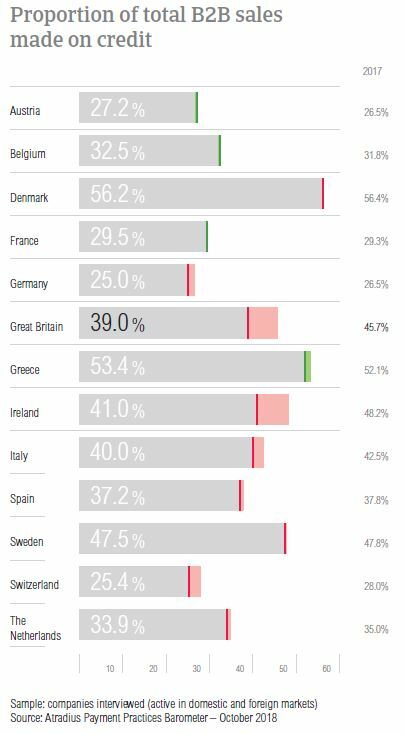 At 48.7%, Great Britain had the highest proportion of past due B2B invoices in Western Europe, significantly higher than the regional average of 41.8%. The proportion of past due B2B invoices in Great Britain is stable at 48.7%. However, this remains the Western European country with the highest proportion of overdue invoices. For most respondents, overdue B2B invoices had negative effects. 20.3% of respondents in the country mentioned the need to take specific measures to correct cash flow and 18.8% the need to postpone payments. While the country’s average DSO is lower than the regional average, in 2018, there was an increase of four days and further deterioration is expected. The proportion of total B2B sales made on credit in Great Britain dropped significantly from 45.7% in 2017 to 39.0% this year. This was one of the biggest decreases in Western Europe, bringing the country’s proportion of sales made on credit almost in line with the average of Western Europe overall. Suppliers in Great Britain mentioned that they mainly sell on credit because it is a common business practice in the industries in which they operate. Additionally, respondents in the country mentioned that they trade on credit terms with B2B customers whose creditworthiness has been well established through long-term business relationships and because this is a way to expand business domestically and internationally. We trade on credit because this is a standard business practice in our industry. Poor payment behaviour and the lack of information on the customer’s business or payment performance were mentioned as the top reasons for refraining from granting credit terms to B2B customers. 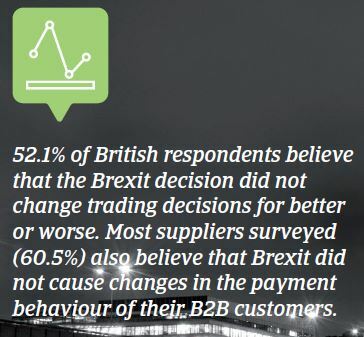 35.7% suppliers in Great Britain mentioned poor payment behaviour in regards to their domestic B2B customers and 32.1% in regards to their foreign B2B customers. The second most frequently mentioned reason – the lack of information on the customer’s business or payment performance – was cited by 14.3% and 32.1% of respondents respectively. We trade on credit with long standing customers who have always paid within 30 days of invoice date. In 2018, an increased percentage of respondents in Great Britain reported late payments by their B2B customers. At 89.6%, the percentage of respondents experiencing this in Great Britain is also slightly higher than that registered at regional level (87.6%). Payment delays were reported to occur more often from foreign than from domestic B2B customers (91.0% versus 88.2% respectively). The proportion of past due B2B invoices in Great Britain has remained stable at 48.7% (48.8% in 2017). However, this was the highest proportion of past due B2B invoices in Western Europe, significantly higher than the regional average of 41.8%. There were significantly more foreign invoices than domestic invoices that remained unpaid at the due date. After a steep decrease in 2017, Great Britain’s average Days Sales Outstanding (DSO) figure increased four days in 2018 to 35 days. Despite the increase, Great Britain’s average DSO is still much lower than the regional average. Asked about the expected DSO trend over the next 12 months, 61.7% of British respondents don’t foresee changes in their DSO, 26.9% fear an increase and a lower 11.5% expect a decrease. There have been no changes in the average payment terms given by suppliers in Great Britain in 2018. Domestic B2B customers have on average 24 days to settle invoices, while foreign B2B customers have 23 days. Confirming the above, the majority of British suppliers (51.9%) said that they do not differentiate payment terms between domestic and foreign B2B customers. Of those who differentiate, a higher percentage (30.4%) are giving domestic B2B customers less time to settle payments (versus 17.8% who said that they are inclined to give B2B domestic customers more time to pay). The main reasons behind the decision to differentiate payment terms between domestic and foreign B2B customers are: the economic situation in the customer’s country, domestic payment terms dictated by law and internal policies. Suppliers in Great Britain reported that payment delays by B2B customers have remained largely stable. Domestic B2B customers delay payments, on average 31 days (32 days in 2017) and foreign B2B customers 36 days (no changes in 2018). 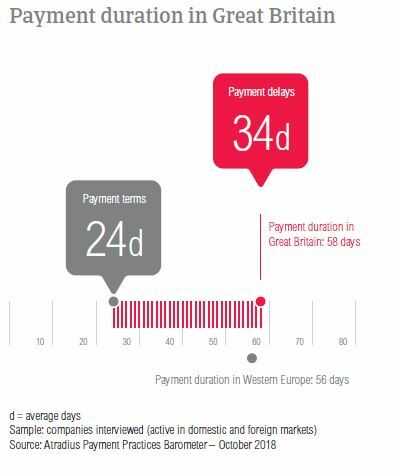 Based on the findings above, there have not been any changes in the payment duration recorded in Great Britain. In 2018, this stands at 58 days and is two days longer than the average registered in Western Europe overall. Suppliers in Great Britain reported that domestic payment delays occurred mainly because of insufficient availability of funds and because of buyers using outstanding invoices as a form of financing. The first reason was cited by 42.7% of respondents while the latter by 30.9%. Payment delays from B2B customers abroad occurred most often because of insufficient availability of funds, the complexity of the payment procedure and buyers using outstanding invoices as a form of financing (35.6% cited insufficient availability of funds, and 26.7% the latter two reasons). 41.7% of British respondents said that overdue B2B invoices had no significant impact on their businesses over the past 12 months. This means that the majority (58.3%) experienced negative effects. The most frequently mentioned were the need to take specific measures to correct cash flow (cited by 20.3%) and the need to postpone payments to own suppliers (18.8%). 13.0% of suppliers reported lost revenue due to overdue B2B invoices. The majority of respondents in Great Britain (72.9%) are using online invoicing with their B2B customers (e-invoicing). This is one of the highest e-invoicing rates in Western Europe (regional average 67.4%). Only 16.4% said that they do not invoice their domestic and foreign B2B customers online. The remaining 10.3% are introducing electronic invoices in 2018. Asked about the effect of e-invoicing on payment duration, the majority (66.0%) believe that after invoicing electronically, they received payments quicker. Only 5.2% of British suppliers said that they have experienced slower payments. 28.8% said there was no noteworthy effect on payment duration. British survey respondents perceive US protectionism turning into a trade war as the most significant risk to global economic growth over the coming six months. 43.7% of respondents believe that this is more likely to affect global economic growth than Fed policy becoming misguided, a ‘hard landing’ in China and geopolitical risk. The second most frequently mentioned potential risk in the UK is geopolitical risk. 21.4% of respondents believed this to be the most significant risk to global growth. In 2018, the average proportion of uncollectable receivables in Great Britain dropped slightly from 1.7% in 2017 to 1.5% this year. This is higher than the regional average of 1.3%. Domestic B2B receivables were written off significantly more often than foreign B2B receivables. 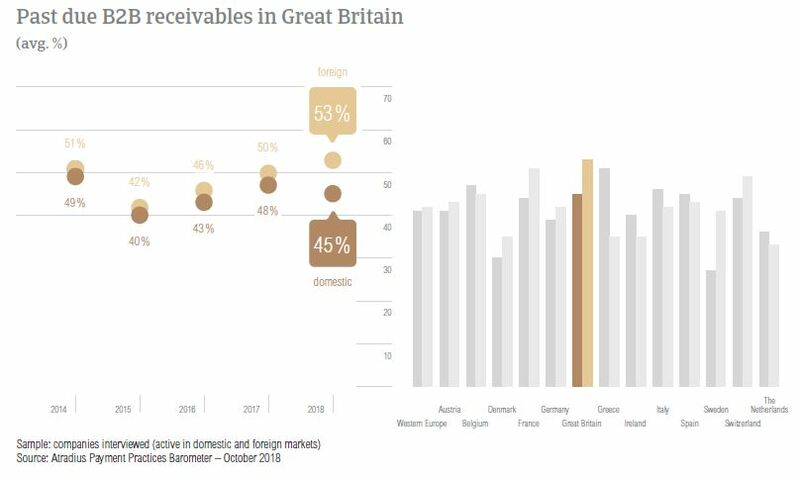 In Great Britain, uncollectable receivables originated most often from B2B customers in consumer durables, construction, business services and services. 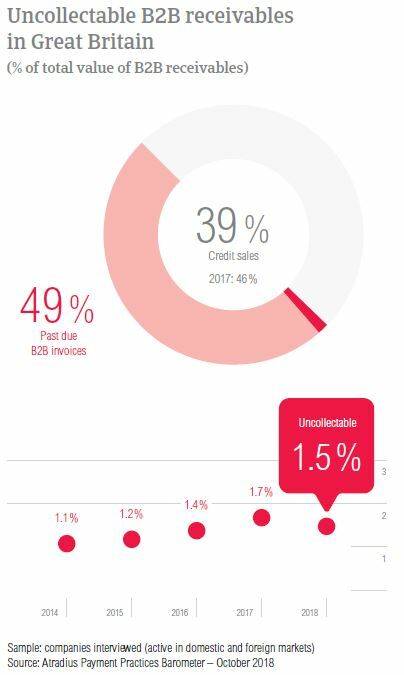 The main reason why B2B receivables were uncollectable was bankruptcy, reported by 49.6% of respondents (significantly lower percentage compared to 2017 when it was 56.7%). Other frequent reasons for write offs are the inability to locate the customer and the failure of collection attempts (reported by 35.9% and 26.5% respectively). In 2018, the average payment term given in Great Britain is 24 days. B2B customers in the metals and construction sectors enjoyed payment terms longer than the country average (29 days and 30 days respectively). In contrast, B2B customers in the agriculture sector are asked to pay much faster (on average, within 13 days). Despite being given payment terms that are on average longer than the country average, B2B customers in the construction sector generated long delays, settling invoices on average, 25 days after the due date. Consumer durables was another sector that generated long delays. B2B customers here paid, on average, 33 days after the due date. The main reasons for payment delays in the construction sector were insufficient availability of funds and buyers using outstanding invoices as a form of financing (mentioned by 42.0% and 31.0% of respondents). 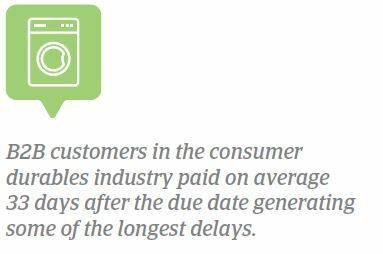 In the consumer durables sector, payment delays were most often a consequence of buyers using outstanding invoices as a form of financing and the complexity of the payment procedure (mentioned by 50.0% and 37.0% of respondents). Looking at the coming 12 months, 59.0% of suppliers in the construction sector do not expect changes in the payment behaviour of their B2B customers, 28.0% expect deterioration and 12.0% expect improvement. In the consumer durables sector, 40.0% of suppliers do not expect changes, 35.0% expect to see an improvement and a lower 24.0% expect deterioration. Having drawn from the expertise of Atradius Collections' local offices, the International Debt Collections Handbook explains the different regulations and procedures for debt collections in the UK.